they came over for dinner tonight, and no one died from my cooking. in the midst of family stories that involved passing gas (and ironically, not from my family! ), i saw a bit of my own family in them (and for more than just obvious reasons). it reminds me of why i enjoy them in my life so much. 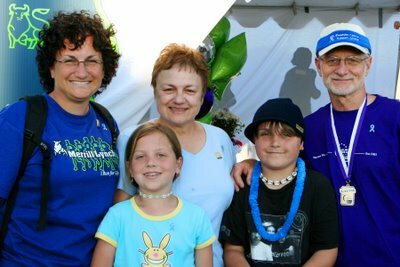 i am so blessed by them - they joined us at relay, where liz was on our team (note the shirt!) and her dad, rich, walked as a survivor. it meant so much to me that they were there with us. they teach me so much...from what my plants and flowers are, to what i shouldn't have growing on my trees and my house, the patience that rich has with my home-challenged skills, to liz's caring heart and watchful eye (especially on karl), to the joys that austin and paige bring to my life with their stories and experiences and crazy tees and perspective on life, and seeing how sandy just loves all of them and takes care of so much. i am a lucky duck to be two doors down. and viper loves the brown rices. Look, I know you work at Merrill Lynch and all, but isn't it still rude to indicate whether someone is rich right after you refer to them? It's fantastic that he is a survivor, though! I think that kid was in my lodge last summer at Camp Hamilton. Hey seminarian, check your email- Austin says he remembers you.